This idea is hosted by Kristi at The Story Siren. Happy New Year! 2010 is looking to be another great book year. I can't wait to start reading all the new releases this year. I even went book shopping this past weekend to look for some of the books on my 2010 Debut Author Challege list. However, the bookstore at the local mall is closing so they didn't have any new releases. Instead they were having a 50% off sale. So, I ended up getting a few books that I have been wanting for awhile and two that I didn't know I wanted until I read the flap summaries. Now seventeen, Willow is living with her older brother, who can barely speak to her. She has left behind hew old home, friends, and school. But Willow has found a way to survive, to numb the new reality of her life: She is secretly cutting herself. Told in an extraordinary fresh voice, "Willow" is an unforgettable novel about one girl's struggle to cope with tragedy, and one boy's refusal to give up on her. Willow is not the type of book that I normally read (lately I've been reading a lot of fantasy). 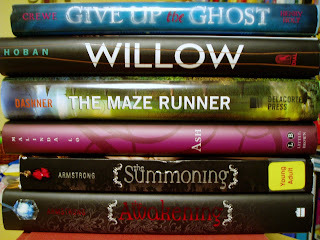 But it was lying on the YA table next to The Maze Runner, so I picked it up. After reading through the flap summary, I read through the first few pages. I was hooked, I wanted to know the rest of the story. Megan Crewe and Malinda Lo are both 2009 debut authors, in fact they are part of the 2009 Debutants. The 2009 Debs are a group of 46 authors whose first books came out in 2009. I have been trying to read as many of their books as possible and was excited to see both Give up the Ghost and Ash on the YA table.